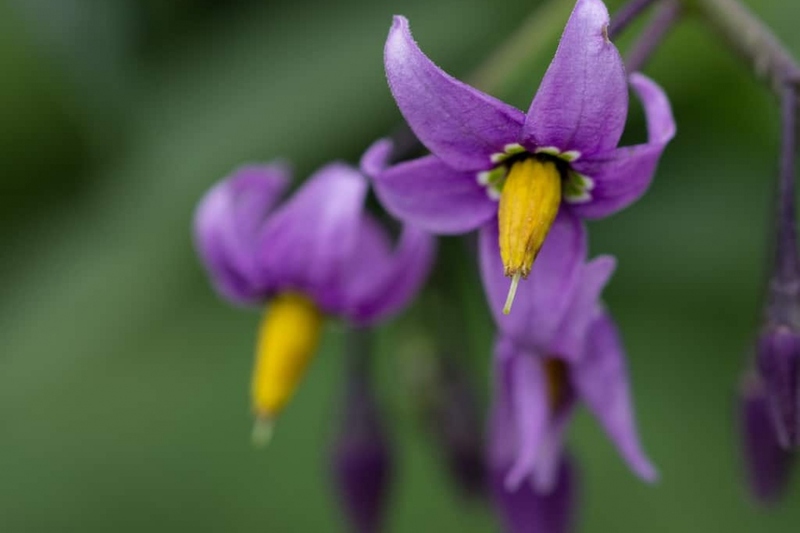 Bittersweet (Solanum dulcamara): identify and learn about your plants with Groww. Solanum dulcamara, known as bittersweet, blue bindweed, Amara Dulcis or climbing nightshade is a species of vine in the potato genus Solanum, family Solanaceae. It is native to Europe and Asia, and widely naturalized elsewhere, including North America, where it is an invasive problem weed. Bittersweet is a semi-woody herbaceous perennial vine, which scrambles over other plants, capable of reaching a height of 4 m where suitable support is available, but more often 1–2 m high. The leaves are 4–12 cm long, roughly arrowhead-shaped, and often lobed at the base. The flowers are in loose clusters of 3–20, 1–1.5 cm across, star-shaped, with five purple petals and yellow stamens and style pointing forward. The fruit is an ovoid red berry about 1 cm long, soft and juicy, with the aspect and odor of a tiny tomato, and edible for some birds, however, the berry is poisonous to humans and livestock.